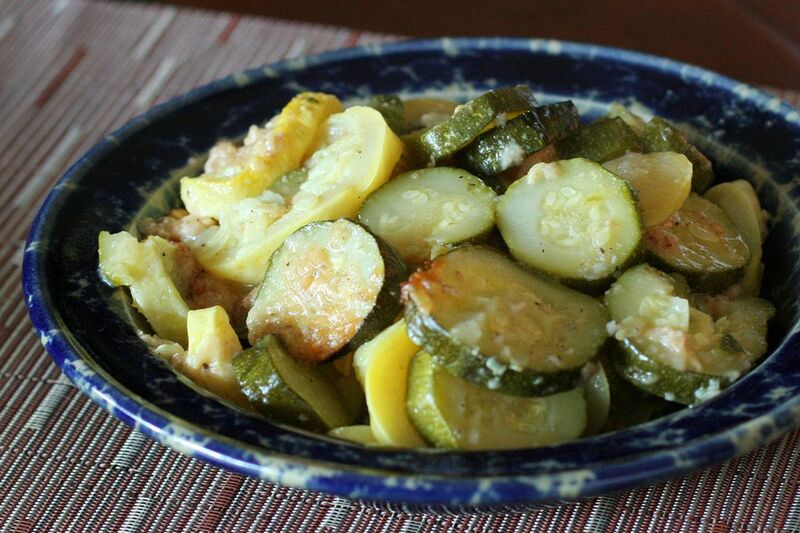 This simple casserole is a delicious way to take advantage of your prolific zucchini and summer squash. Plus, it is relatively light because it doesn't have the heavy sauce most casseroles contain. It's a combination of the two kinds of summer squash—yellow and zucchini—with garlic, butter, breadcrumbs, and grated Parmesan cheese. This easy squash bake is an excellent side dish for a summer cookout or everyday dinner. If you like onions, feel free to chop a small onion and add it to the squash mixture. Or give it some color (and flavor) with strips of red bell pepper. Fresh sliced grape tomatoes are another great option, as tomatoes go well with summer squash and zucchini. Or cut one or two standard tomatoes into wedges and add them to the squash. If you have an abundance of zucchini from your backyard garden or local farmers market, omit the yellow squash and use all zucchini. Or, if you have a surplus of yellow crookneck or straightneck squash, use that. The squash is sliced and then baked to perfection with a topping of breadcrumbs and Parmesan cheese. The casserole is a delicious side dish to serve with grilled meat or chicken or serve it with a fish or seafood meal. Wash the squash and then trim and discard the ends. Quarter the squash lengthwise and then cut them into 1/2-inch pieces. Transfer the squash pieces to the prepared baking dish. Sprinkle the squash with the 3/4 teaspoon of kosher salt and 1/4 teaspoon of freshly ground black pepper. Combine the chicken broth with the minced garlic and pour over the squash. Cut the butter into small pieces. Dot the casserole with the butter and then sprinkle with the breadcrumbs and Parmesan cheese. Cover the baking dish tightly with foil and bake for 35 minutes. Uncover and bake for about 15 to 20 minutes longer, until the topping has browned and the squash is fork-tender. If you use fresh breadcrumbs, toss them with 1 tablespoon of melted butter before you sprinkle it over the casserole. Keep breadcrumbs on hand for casserole toppings or meatloaf whenever you need them. Just process day-old bread in the food processor to make fine or coarse crumbs. Freeze them for up to 3 months in a zip-close food storage bag or freezer container. Label the container with the name and best-by date. Use plain white bread, French bread, sourdough, or whole grain bread.